Mammoth, the fossil elephant of Siberia (elephas primigenius, Blumenbach), found in the diluvial strata of Europe and Asia, and perhaps also in North America. Large fossil bones were alluded to by Theophrastus, Pliny and many ancient author, and were generally supposed to be the remains of giant men. They are abundant in the drift of central and northern Europe, mingled with the bones of other pachyderms, principally in river basins; in Great Britain, in the Kirkdale cavern of Yorkshire; in Sweden and Norway; but most abundantly in the frozen region of European and Asiatic Russia, about the mouths of rivers descending into the icy sea; there is indeed hardly a river in Siberia in whose bed or on whose banks these remains have not been found, as well as in the neighboring plains, in connection with bones of other animals now strangers to the climate; they are not found in the elevated districts. In Siberia fossil ivory is so abundant and so well preserved that it gives rise to a considerable traffic both for home and foreign use. 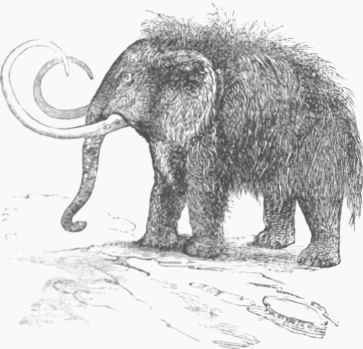 The most remarkable discovery in relation to the mammoth was the occurrence of a carcass found by a Tungus fisherman in a block of ice on the border of the Arctic sea in 1799, near the river Lena; in the course of a few years this immense mass was thawed out, and it was found to be an elephant having the flesh and soft parts well preserved, with the exception of such portions as had been devoured by bears, dogs, and other carnivorous animals; the tusks were very fine, weighing 300 lbs., and were removed by the fisherman. In 1806 Mr. Adams, travelling for the museum of St. Petersburg, visited the locality and collected the remains, which were transported to St. Petersburg, where this skeleton now is, with many others, in a nearly perfect condition; he ascertained that the skin had an abundant covering of hair and wool, indicating that it was fitted to resist a cold climate. It is evident that the climate of Siberia during the diluvial period was not like that of the regions now inhabited by elephants; it nyist have been moderately cold, though such as would permit the growth of a vegetation more luxuriant than any in the present arctic regions, and sufficient for the nourishment of these bulky animals. Another more recently discovered specimen allowed even a microscopic examination of the tissues. The following are the differences between the fossil and living elephants, as determined by Cuvier. In the former the lamina of the teeth are narrower and more numerous than in the Indian elephant, which they most resemble, with the lines of enamel more slender and less festooned, and the teeth absolutely and relatively wider. The tusks are larger than in most living specimens, and generally more curved, but the structure is the same. In the skull, there is much greater length and perpendicularity in the sockets for the tusks; the head is more elongated, with a greater development of occiput, and concave and nearly vertical forehead; the long alveoli must have modified the trunk, and have given the animal a different physiognomy from that of the present elephant; the antero-posterior length of the lower jaw is less, the lower molars are parallel instead of converging forward, and the jaw is truncated in front instead of having a projecting grooved symphysis. The bones of the limbs are more massive, and the usual distance between the two condyles of the femur is reduced to a narrow line. The skin is like that of the living elephant, but is covered with hair of three kinds; the longest, 12 or 15 in., is brown and like horse hair; the shorter, 9 or 10 in., is more delicate and fawn-colored; and the wool at the base of the hair, 4 or 5 in. long, is fine, smooth, fawn-colored, and a little frizzled toward the roots; there is a mane on the neck, and the whole covering is well suited for a cold climate. The mammoth has never been found living, nor have any of the existing elephants been discovered in the fossil state; it was probably not much if at all higher than the elephants of the present epoch, but was stouter, more clumsy, and heavier. Their bones are found mingled with those of the rhinoceros, ox, antelope, horse, often with marine animals, and sometimes with fresh-water shells. They were undoubtedly overwhelmed by a comparatively recent and sudden catastrophe during some portion of the long drift period, accompanied by a depression of temperature, and probably by a subsidence of the land and an invasion of the sea, general over the northern regions of both hemispheres; during the preceding tertiary epoch there was an elevation of temperature, permitting tropical animals to go far to the north; this temperature gradually became colder, the animals becoming adapted for it, as shown by their external covering, until they suddenly became extinct during the glacial period of the drift. From the abundance of the remains found in Siberia, it is inferred that elephants were more numerous during the diluvian epoch than at the present time. To the E. primigenius belong the Siberian fossils, and most, if not all, of those of the drift of Europe. - Several species of fossil elephant have been found in North America, referred by some to the E primigenius. Prof. H. D. Rogers ("Proceedings of the Boston Society of Natural History" vol v., Feb. 1, 1854) drew attention to the tact that while the European mammoth is tound m the drift stratum, the North American fossil elephant is imbedded in strata above the drift, of a distinctly more recent age, and was a contemporary of the mastodon gigant their bones being found together in the marshy alluvium of Big Bone Lick; he maintains that they lived together in the long period of surface tranquillity which succeeded the brewing of the general drift (the period of the Lauren-tian clays), and were overtaken and exterminated together by the same changes, partly of climate, partly of a second but more local displacement of the waters which reshifted the drift, and formed the later lake and river terraces. 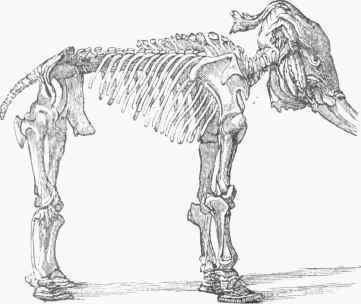 From figures on bones, it is beyond doubt that the mammoth lived with man in the early stone age. In the pliocene deposits of Kansas and Nebraska Dr. Hayden found bones of mastodon and elephant (E. hnpera-tor, Leidy), and a similar coexistence has been ascertained in the pliocene of Europe; the remains of this and E. Americanui have been found in Kentucky, Texas, Mexico, Spanish America, from Alaska to Georgia and the Mississippi valley, and as far west as Oregon and California. The elephants of the tertiary sub-Ilimalayan Sivalik hills have been described by Cautley and Falconer; in these the dental lamina) are so separated that each forms the summit of a ridge, making a transition from elephant to mastodon, constituting the genus stccodon (Cautley and Falconer). The mammoths of the American continent are now admitted to be different species from those of Europe and Asia. - For details on the mammoth, see Cuvier's articles in vol. viii. of the Annales du Museum, and in vol. i. of the Osse-mens fossiles; Pictet's Traiti de paleontologies vol. i.; vol. v. of the "Naturalist's Library,11 which treats of the pachyderms; and vols. ii. and iv. of the "American Naturalist".